The state’s career leader in strikeouts, Norton senior Kelly Nelson has a 16-1 record with a 0.65 earned run average this season. What constitutes a successful senior year? Setting a state record for career strikeouts in the circle, with 1,245 and counting? Being elected vice president of your class? Or even getting a call to pitch for the national women’s softball team of Ireland on the road to the 2020 Olympic Games? Yes, it’s been quite a year for Norton senior Kelly Nelson. But one achievement, thus far, has been elusive — a Division 2 state championship. “It’s always everyone’s dream to win the state title,” said Nelson, who will carry a 16-1 record with a 0.65 earned run average into Wednesday’s nonleague showdown at Walpole. The MIAA tournament pairings will be released next Tuesday and Norton will be a top seed in the Divison 2 South bracket. Nelson didn’t accomplish all these accolades overnight. As an eighth-grader, Nelson was called up to the junior varsity, playing for current varsity head coach Wade Lizotte . 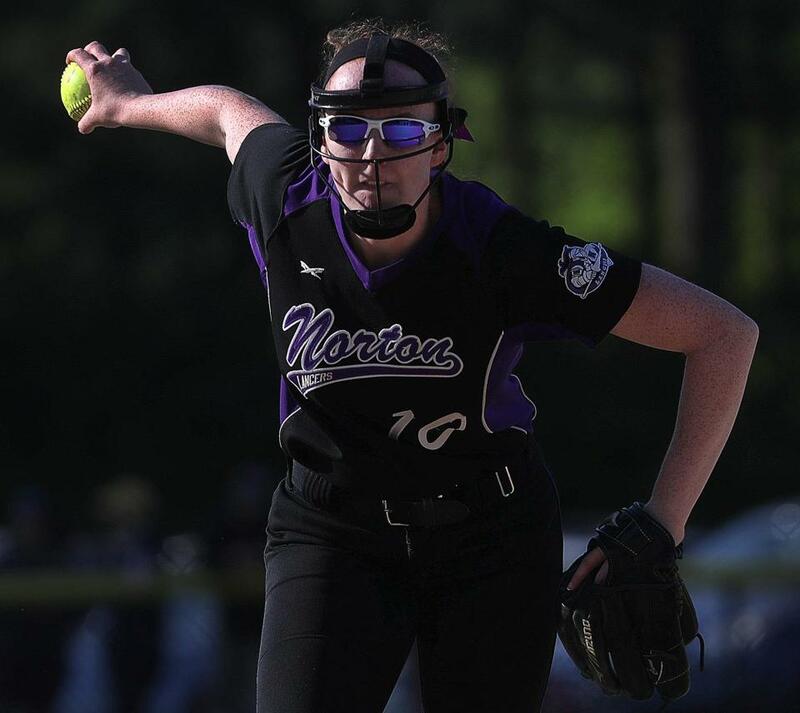 Between eighth grade and her freshman year at Norton, Nelson grew immensely as a player, coinciding with her work with coach Kim (Jeffs) Popieniek , the former Stoughton and Plymouth State star who founded Maximum Performance Pitching. Their work certainly paid off. As a freshman, Nelson pitched a young Lancer squad to an 18-2 regular season and a Division 2 South title. And she has been dominant in the circle ever since. The Globe’s reigning Division 2 Player of the Year, she is headed to Holy Cross in the fall. She will make her international debut for Team Ireland this summer at the U19 and U22 European Championships in Italy and Slovakia, respectively. Her grandmother was born in Ireland and Nelson recently applied for, and gained, dual citzenship. Lizotte recalled an instance last week following practice on a hot day. As he was preparing to leave, the coach saw Nelson in her running clothes jogging around the building. And even as a team captain, Nelson will not shy away from cleaning up after home games or carrying equipment on the bus for road games. In the classroom, Nelson finished among the top of her class and was a member of the National Honor Society. ■ In addition to owning Bridgewater-based Maximum Performance Pitching, Kim Popieniek runs Shockwave Softball, a non-profit that she started when she realized that there needs to be a place for players “to get some mental confidence and not just focus on the physical aspects. Kayla Georgeu (Oliver Ames), Kayleigh Litchfield (Duxbury), Amelia Anslow (Taunton), and Madison Schwartz (Bridgewater-Raynham) are among the players in the program. ■ The Patriot League has been competitive from start to finish this spring, with Hanover, Silver Plymouth South, and Silver Lake all sharing the spotlight. And that competition in the league will only serve teams well in the state tourney. The Lakers have faced those pressure situations. They were dealt a 4-3 loss in extra innings to Plymouth South. “Our tough league play as well as our challenging nonleague schedule I think really gives us a good indication of where we stand right now and gives us a taste of that tournament atmosphere during the regular season,” Pina said. That experience has been invaluable for Brenna Welch, in her first season as the Lakers’ No. 1 starter. ■ Tianna Dawe, Peabody, Junior – In a 3-for-3 afternoon, the junior smacked two home runs, doubled, and knocked in three runs in a 9-0 win over Swampscott. She also struck out 13 while allowing only three hits. ■ Emily and Hannah Masterson, Plymouth South – Hannah, a sophomore, went 4 for 4 with an inside-the-park homer, two triples, and four RBIs in a 10-3 win over Carver on Monday. Emily, a senior, had game-winning RBI in the eighth inning of Wednesday’s 4-3 win over Silver Lake. ■ Kelly Nelson, Norton – The senior set the state’s career strikeout mark — surpassing former Milford standout Shannon Smith — by fanning the only three batters she faced in Wednesday’s 14-2 win over Westwood. Nelson then added seven K’s in a 9-2 win over Abington, pushing her total to 1,229. ■ Kelsey White, Taunton – The freshman had three hits and four RBIs in a 14-5 win over Oliver Ames. Then she struck out five in a complete-game 10-4 win over Dighton-Rehoboth. In a 13-0 victory over New Bedford, she cracked two triples with two RBIs. ■ Ryley White, Dracut — She fanned 12 while allowing just two hits in a 2-1 loss to No. 2 Austin Prep. The junior followed with 18 strikeouts in a 1-0 shutout of Westford Academy, yielding three hits. ■ Wednesday, Marblehead at Peabody, 4 p.m. — A battle of North Shore contenders with the Magicians (16-1) and the Tanners (15-2). ■ Wednesday, Norton at Walpole, 3:45 p.m. — Kelly Nelson has shut down nearly offense she has faced in her superlative senior run. But Walpole (14-2) is averaging nine runs per game. ■ Thursday, North Attleborough at Milford, 3:45 p.m. — The Scarlet Hawks’ 5-1 win at North Attleborough on May 16 was the tightest game of the spring for the Globe’s top-ranked team since the opener. What will the rematch bring? ■ Saturday, Dracut at Austin Prep, 4 p.m. — Last week, Prep made the most of its two hits in a 2-1 win over the Middies. Now Dracut has another shot at the No. 2 Cougars. ■ Monday, Norton at Braintree, 3:45 p.m. — On the last day of the regular season, it’s a duel between aces Kelly Nelson (Norton) and Erin Barry (Braintree). Dan Shulman can be reached at daniel.shulman@globe.com. Brandan Blom also contributed to this story. He can be reached at brandan.blom@globe.com.